Mysuru: Kelapanda N. Manjunath (Kiran), who is serving as an English lecturer and NCC Officer at Government PU College, Ponnampet, has won this year’s State-level Best Teacher Award. Chief Minister H.D. 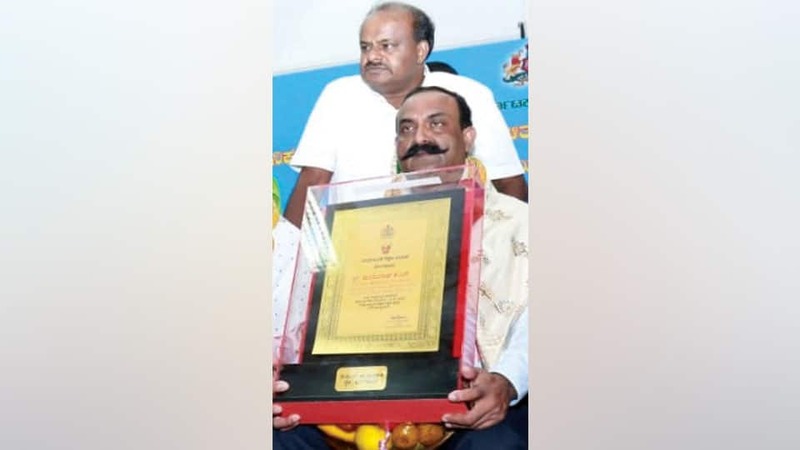 Kumaraswamy presented the award to him at a ceremony held in Bengaluru on Sept. 5, to mark Teachers’ Day. In a noble gesture, Manjunath has donated the prize money to Kodagu Flood Relief Fund. Son of late K. T. Nachappa and Kalamma, retired Head Mistress, Manjunath had won the District Best Teacher Award in 2007. He has attended two International, three National and 12 State seminars. A master resource person, he has trained many teachers as resource persons in Kodagu district and has also won many prizes in Education Department and is active in co-curricular activities. Manjunath became NCC Officer after undergoing National Training at Maharashtra’s Officers’ Training Academy. He has sent girl cadets twice to National Hockey in Ranchi and Delhi from his college. His daughter Nidhi Kiran has represented Bangalore University Football team as the Captain and is presently doing Master’s in Manipal University. His wife Rekha Kiran (Addengada), is presently a member of Hathur Gram Panchayat.